Determine the Timeframe: when things date to, what comes earlier and what later. Reconstruct Past Lifestyles: what people did and how they lived in their environment. Explain Cultural Change: how and why cultures changed over time. 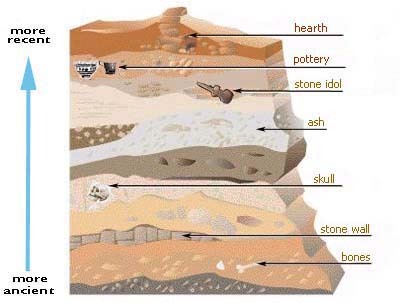 The things people leave behind are eventually covered by layers of soil (strata). This is happening all around you every day. Wind storms – in time – cover abandoned farms with sand and dust; flooding rivers bury cars in mud; workers build new houses over old foundations. Imagine these events happening over hundreds and thousands of years, and you may begin to appreciate how many layers of history lie hidden beneath your feet. To uncover this historical record, you can’t just dig random holes. This would break up the soil layers, which can tell us a lot about the time when they were deposited. Therefore, excavation methods are very precise and time-consuming. It’s like taking apart a tall layer cake – starting with the top (present day) layer and working down to the bottom (oldest) layer. To understand the entire story, each layer is carefully studied before digging to an earlier layer. 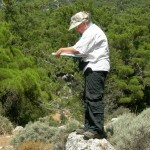 Dr. Barbara Hayden, from the University of Pennsylvania Museum, spent years studying ancient settlements in the Vrokastro area of eastern Crete, and she has written some important books about her research. 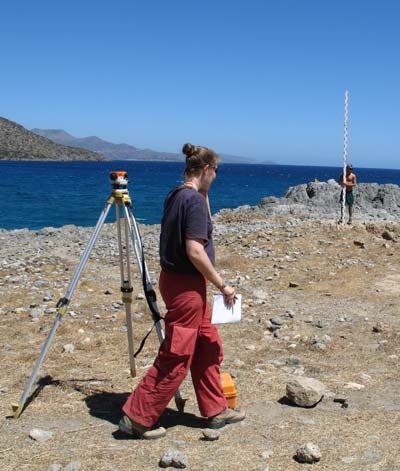 When we met, she was awaiting government permits for a new excavation at Priniatikos Pyrogos, a limestone headland jutting into a bay in the Gulf of Mirabello. 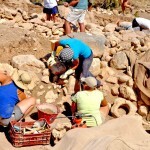 No archaeological dig can be done in Greece without permission. Until the permits arrived, her team of archaeologists, technicians and students kept themselves busy in various ways at the Center. They were all anxious to get into the field – as we were. Of course, the first step in excavation is to find a place to dig. This is done using historical information, field surveys, aerial and satellite photography, and a variety of other methods. When a promising site is located, it is probed to determine whether excavation is worthwhile. Archaeologists might use rods or borers to locate solid objects – or hollow spaces – underground. Or they can employ remote sensing equipment, such as a magnetometer or ground-penetrating radar (GPR) to “see” what lies beneath the surface. Dr. Hayden’s excavation site is part of a larger settlement in the area. 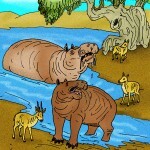 She selected Priniatikos Pyrgos because of its size, likely complexity, and long-time human habitation (thousands of years). This is a new dig to extend the study area. An EDM (Electronic Distance Meter) survey instrument records coordinate points and elevations that can be transferred to a computer and used to create contour maps and three-dimensional texture maps, as well as models of structures on archaeological sites. The crew uses the global positioning system (GPS) and survey equipment to establish the primary datum – a known reference point. From this starting point all other measurements are made. Stakes mark reference points on N-S and E-W lines from the datum, and twine is tied between the stakes. Sometimes the whole excavation site is crisscrossed with twine. It’s a lot like placing a huge sheet of graph paper over the site. This graph, called a site grid, makes it possible to locate everything within the excavation. In the example shown above, each square of the site grid represents one meter on the ground. So, starting from the southwest corner of the grid (this is standard practice), one can easily measure the distances of 2 meters east and then 8 meters north to plot the exact location where an artifact was found. The site grid is not just horizontal, of course, because digging uncovers objects below the surface. Vertical measurements based on the primary datum provide a three-dimensional reference. The trench is dug down evenly in levels, which are determined by changes in soil color or texture. It is very important to keep all walls smooth and straight and to separately excavate soils of different colors within a level. All soil removed is screened to extract things the diggers didn’t see – such as small flaked stones, bone fragments and (especially at this site) bits of burnt metal. Larger artifacts were recorded on the site grid, photographed in place and then carefully removed using a small trowel, picks and brushes to avoid any damage. Features, such as ancient walls, floors and kilns, were preserved and photographed in place. Documenting and mapping everything, while time-consuming, is the most important task during an excavation. Each level of the trench is described in different ways, including the start and stop depths, soil color and texture, and a list of whatever was removed from the trench. Each artifact, bone and soil sample collected is put into a bag labeled with its exact location and a catalog number. Each pottery sherd is labeled and coded in the hope that enough pieces are found to reassemble the pottery. A plan map of the level is drawn to show the location of finds. Profile maps (like the stratigraphy illustration above) are drawn to show soil changes, features and artifacts through the unit. Photographs of features and completed trenches are also taken to document the excavation. It is important to remember that digging is a destructive process. Once you excavate, you can’t put the soil back the way it was and search again for what might have been overlooked. This is why it is necessary to continuously record everything in order to get maximum possible data from an excavation. Findings at the Priniatikos Pyrgos excavation indicate this was part of a much larger harbor settlement occupied from the late Stone Age into the historic period (5000 years). People settled here because the location offered a fertile river valley (for agriculture), convenient cross-island routes and a protected anchorage (for trade), and access to unique resources (for industry). These resources included clay for ceramics, iron ore used to make the pottery harder and – later – to produce iron, and plenty of firewood to fuel the kilns and furnaces. Even the sea winds were important, because they fanned the industrial kilns and brought merchant ships to the harbor. The excavations also reveal later aspects of the settlement’s history. In one trench, for example, diggers find a paved path dating to the Ottoman period. 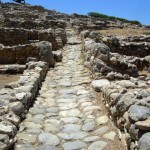 Below this walkway they discover the walls of Roman buildings – possibly houses. Beneath these, in turn, are a few more broken walls and some fine Greek pottery, and below that is a rubble-built wall associated with a plaster floor and Minoan pottery. All were built in the same place at different times in history. 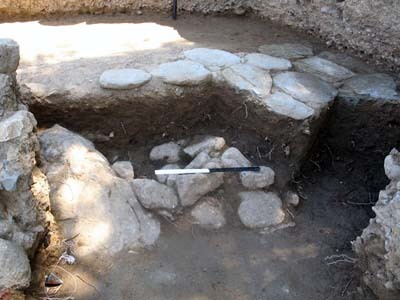 Kilns and ancient pottery found at the lower levels of the excavation indicate this was a major ceramics manufacturing center and commercial seaport during the Minoan period (around 1750 to 1550 BCE). It produced vases for export or as containers to ship local wine, honey, or olive oil. Later settlers built over the homes and workshops of Minoan craftsmen, and each occupant left evidence of their time – which is now uncovered by Dr. Hayden’s excavation. 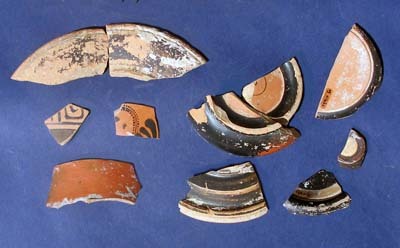 The most unexpected of these finds are sherds of fine Athenian black glazed and red-figure vases from the 6th to 4th centuries BCE. These goods imply economic and historical ties between Crete and the Greek mainland during a critical phase in the development of Greek civilization. 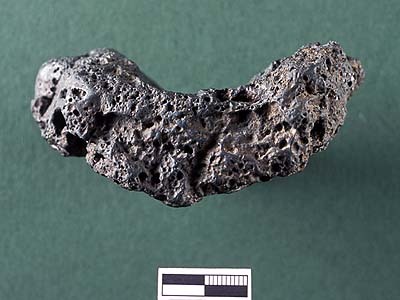 The discovery of smelting furnaces at the site and bits of iron slag in the soil provides evidence of iron production using local ores. In those early days iron was more valuable than gold, so the importance of an industrial center like Priniatikos Pyrgos is clear. 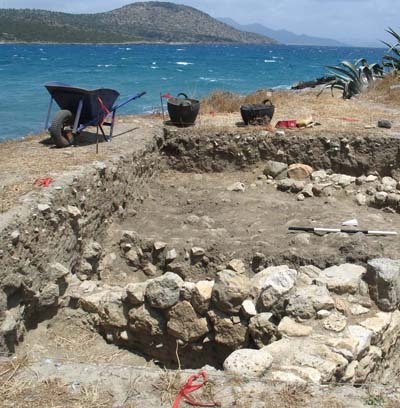 Future excavations will reveal more about the cultural development of the region, as well as the exchange network in industrial and agricultural products that extended across the Aegean Sea. When thinking about Priniatikos Pyrgos, ask yourself why your town exists. 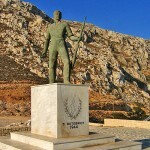 Go to the local library, read about the history of your town and compare it with what we know about Priniatikos Pyrgos. Although each one is unique, you will discover that every town was created for practical reasons. The land had resources, which prompted the creation of specific kinds of businesses; the location offered unique advantages (access, safety, commerce routes, or others); and certain types of people decided they could build a life at that particular place. And if you think about the ways people work and live in your town, and how the work and people have changed over the years, then you are starting to think like an archaeologist. My daughter usually requires entertainment to get into investigations. You offer an approach that draws children into learning situations. Thanks for your efforts.